Our storefront includes a large selection of Instruments and Accessories, instrument & PA rentals, full-scale repair shop, education center, and friendly & helpful staff. 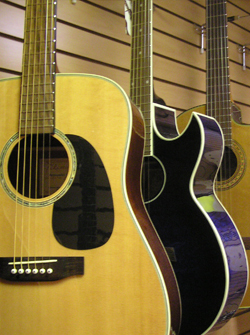 River City Music offers a wide variety of services including: Music Lessons, Instrument Rentals, Repairs, and a whole store filled with merchandise for any musical project your heart desires. Here at River City Music, you will never walk away with the wrong merchandise, or something that isn't pertinent to your musical endeavors. We have employees that specialize in each instrument that we sell, and will aid you in your purchase, and strive to make sure you are pointed in the right direction.